Before each semester, the Action Lab application matching process creates 4 collaborative teams that will work together to research and offer solutions to a real-world problem. Teams begin with a problem or question posed by a community partner, and also include a faculty fellow and about 6 students (combined from Capital Community College and Trinity College), whose work will be supervised by the Action Lab Director. The Action Lab also welcomes other arrangements, such as two community organizations that pair up on a broader research question, with up to 8 students and one or more faculty fellows. See completed and current projects, and contact us if you have questions or need help with our application process. 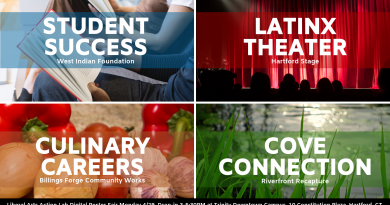 Hartford community partners are broadly defined to include neighborhood groups, non-profit organizations, government agencies, social entrepreneurs, and others focused on the city. Identify a problem or question that you’d like a research team to help answer, which will improve Hartford or its role in the metropolitan region. Must be available to meet with the team at least once a month (either Tues/Wed/Thur afternoon or Wed evenings) at our downtown campus. Submit a brief proposal on the Partners page by February 27. Hartford Resident Advisory Board will discuss and numerically rank proposals in early March, based on their overall quality and importance to the city. The Action Lab Director will appoint this jury pool of 8-10 city residents who are active in civic life, familiar with academic research, and reflect the demographics of Hartford. Advisory Board members may not participate in a discussion of a proposal submitted by an organization with which they (or a close family member) are affiliated. After this meeting, the Action Lab will display highly-rated proposals at the top of the Apply website and may remove lower-rated ones for partners to revise and resubmit in the next round. Faculty Fellows are invited to apply to project teams, in order to provide academic guidance and evaluate student work for at least one semester. Must be available to meet with the project team at least once a month (either Tues, Wed, or Thurs afternoons, or Wed evening) at our downtown campus, plus one additional pre-semester meeting of all faculty fellows. (The Action Lab Director will supervise teams of students on a weekly basis.) Full-time or part-time faculty, advanced graduate students, or staff with subject or method expertise, from CCC, Trinity, or other institutions in the Hartford Consortium for Higher Education, are welcome to apply. Fellows may receive $1,000 to compensate their time for one semester, which may be paid as a(n) stipend/honorarium or as reimbursement for related expenses. List your project preferences on the Faculty Fellows page by March 31. Students from Capital Community College and Trinity College are invited to apply to enroll in the Action Lab course (meets Monday afternoons, 1:15-3:55pm) and to join a project team (meets either Tues, Wed, or Thurs afternoons, 1:15-3:55pm, or Wed evenings, 6:30-9:10). Both will be taught by the Action Lab Director at our downtown campus. Successful students will earn the equivalent 2 Trinity credits or 6 CCC credits. List your project preferences on the Students page by April 8. Anyone may add your name and email to receive Action Lab updates. Contact us if you have questions or need help with our application process.